I wanted to do a search of ChEMBL to see if it contains any phase III or phase IV approved drugs that are carbamate benzamidazoles (like albendazole). The 'A' here means any atom. This 'A' doesn't seem to include H though, so I had to do another search using '-OH' instead of the '-OA'. [Later note: actually it's not necessary to do -OA here, you can just do '-O' and the software shows a -OH but this substructure search will hit things with -O-A unless you specifically draw in a -O-H (ie. H instead of A)]. Then I clicked on the 'Substructure search - Fetch compounds' button under the 'Marvin JS' chemical drawing tool, on the ChEMBL webpage. This brought back 248 hits. - For some reason the 'atom toolbar' seemed to disappear when I was using Safari. I tried using Firefox instead and it was there again. 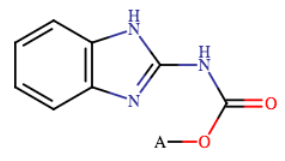 Not sure why this is..
- When I searched ChEMBL for compounds containing a -SO3 substructure, it got hits that on first glance didn't seemed to contain this substructure. 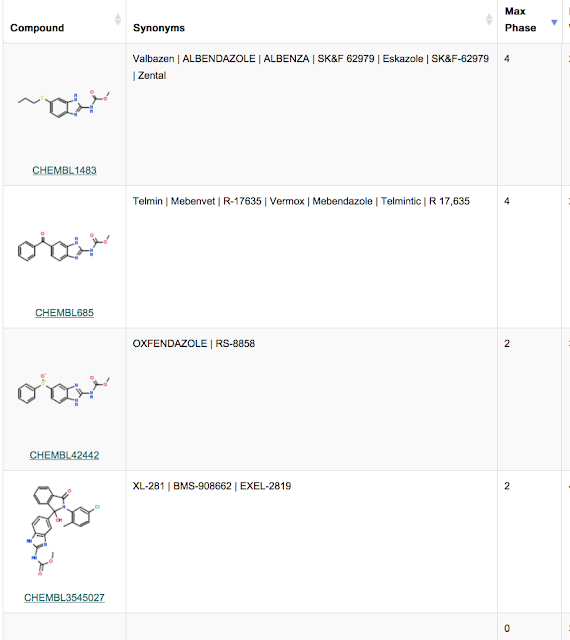 However, when I looked at the ChEMBL pages for those hits, they said 'Alternative forms of this compound in ChEMBL', and those alternative forms did have -SO3 substructures. So I guess it was searching the 'Alternative forms' as well. - The 'A' atom seems to mean any atom except H.
- I found that when I search for a benzene ring with -OH attached, it also finds hits that have benzene attached to -O-(something else) so that it doesn't seem to enforce that it's -OH.